We handle underground storage tank projects -- from simple decommissionings to complex sites where soil and groundwater are impacted. 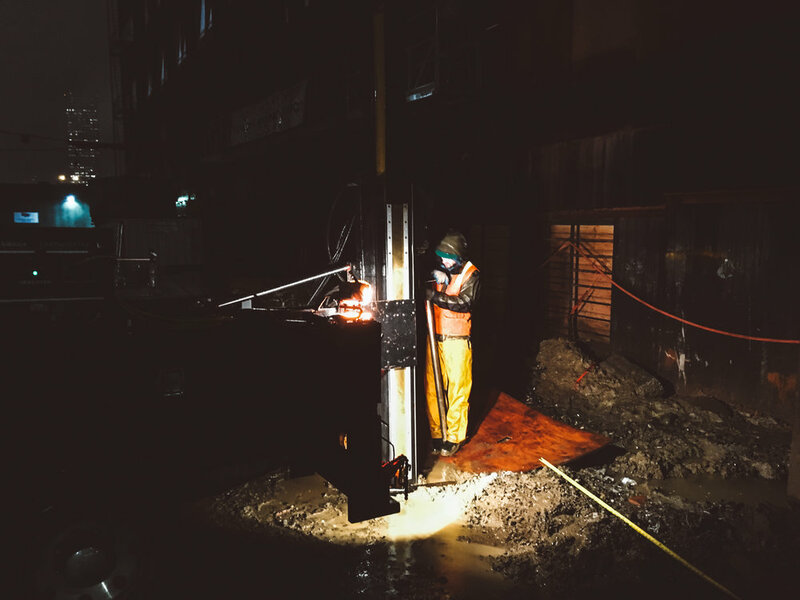 Our detailed examination of soil cores collected with our in-house drill rig is an important step in our work. Count on us to go the distance in meeting project deadlines and minimizing impact to occupants on site. Our underground storage tank projects range from small commercial heating oil tanks to large fuel distribution facilities. We offer design, installation, and monitoring of soil and groundwater treatment systems. We approach every project, small or large, with attention to detail and a focus on delivering the highest quality service. Groundwater monitoring services are part of many of our ongoing projects. We're at home conducting extensive environmental work within an active construction zone. We help our clients by putting their needs at the center of everything we do. Whether providing due diligence and risk assessment, remediation design, soil removal, installation of monitoring wells or any of our other services. We achieve cleanup objectives for contaminated soil and groundwater in accordance with the requirements of regulatory agencies and lender policies. We work with prospective purchasers, as well as commercial and industrial operators. In a situation requiring remediation, we carefully assess parameters to implement systems using risk-based decisions involving a variety of approaches. These may include natural attenuation, excavation and off-site treatment, vapor extraction, air sparging, pump and treat, bio-remediation, and/or integrated technologies. We own and operate a drill rig in-house, which has allowed us to offer shorter turnaround times. All Phase I ESAs are conducted in accordance with current ASTM Standard E1527 and are AAI complaint. Typical turnaround is 15 business days or sooner. Occasionally we are able to offer a quicker turnaround.